It is the responsibility of the installer to follow the instructions provided with the specific fire pit model but here you will find helpful information that applies to all outdoor gas fire pit enclosure requirements and recommendations. 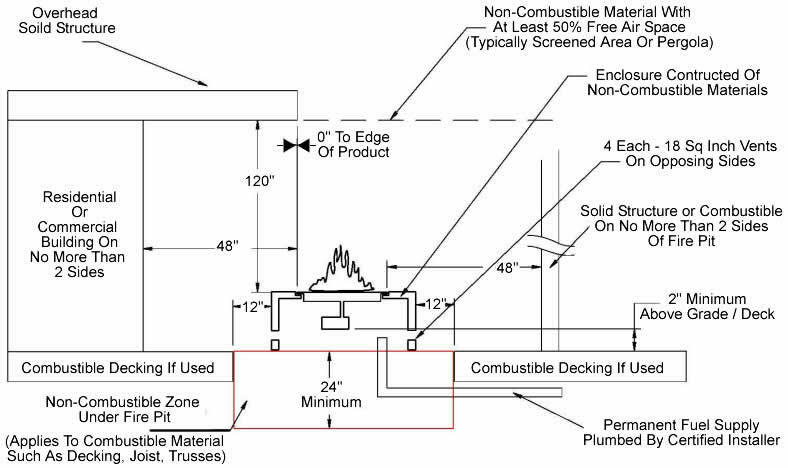 Construct entire enclosure of stable and non-flammable materials. Must be installed outdoors only and must be at least 48" away from any structure. See drawing below. The enclosure must incorporate 1 vent on at least two opposing sides (2 vents total) at a minimum size of 18 sq. inches each (Example: 3" x 6" or larger). Installation of the vents in the mid to lower area of the enclosure is recommended. Ventilation allows for heat and or residual fuel to escape. Make sure that the structure is level. We recommend the use of the installation collar (optional) that may be mortared into the surround so that the burner pan can be easily removed for maintenance. 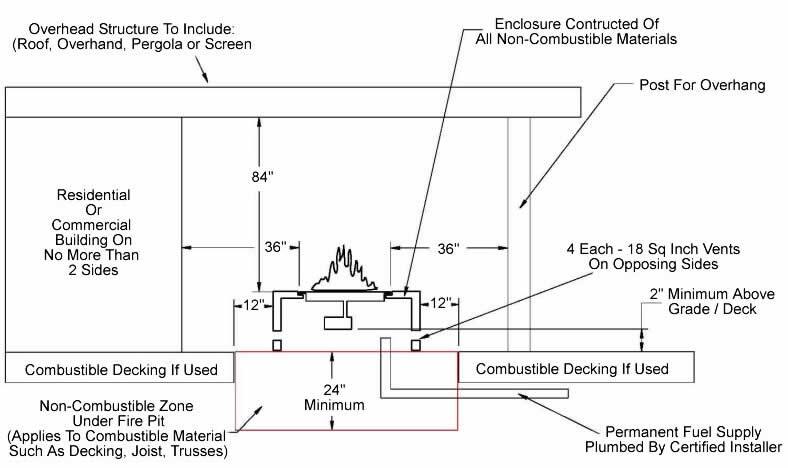 The fire pit assembly should be recessed a minimum of 2.25" from the top of the enclosure to protect flame from being blown out. Some areas may require more- 4" to 6" is not uncommon. Fire Pit must be installed above ground and have good drainage. For electronic ignition models, the interior void space of the enclosure surrounding the valve box cannot be filled with any material (gravel, crushed rock, concrete, etc.) It is a requirement to have a minimum of 2" under the valve box for proper ventilation and drainage. For electronic ignition models, there must be an electrical shut off (wall switch or breaker) on the exterior of the fire pit or on adjacent wall to allow for emergency shutdown and maintenance. Gas shutoff must be outside enclosure – refer to your local codes. A fire pit enclosure access door is not required but is recommended to allow easy access to plumbing and electrical inside the enclosure.